NORWALK -- Six weeks ago a kidney donation by Norwalk resident Ned Brooks triggered a "kidney chain" resulting in a series of donations for three transplant recipients. Thanks to this, Brooks has become an advocate for the importance of donating organs. "How the donation all came about was that I was listening to a podcast by a Harvard professor who created algorithms for individual exchanges between individuals without the use of money," Brooks said. "There is no money exchanged in a kidney donation but the same concept is applied beautifully. As an altruistic kidney donor you are the first person in a cascading chain of transplants in which you can impact a lot of lives." According to the National Kidney Registry there are three types of kidney donation: Direct donation in which the donor generally knows the recipient; a Paired Exchange Donation in which a donor will donate their kidney to another recipient in exchange for a compatible kidney for their loved one; and, in Brooks' case, a Good Samaritan or Altruistic Donation, in which the donor gives to a stranger which initiates a chain of transplants. "Donating a kidney to an individual was not sufficient for me to act on this, but the concept of a donation triggering multiple transplants was compelling to me," Brooks said. Brooks referenced kidney chain donations that have benefited up to 30 recipients. "The fellow who started that chain said, and this is how I feel, 'You think it's odd that I'm donating my kidney -- I think it's odd that you think it's odd,'" Brooks said. 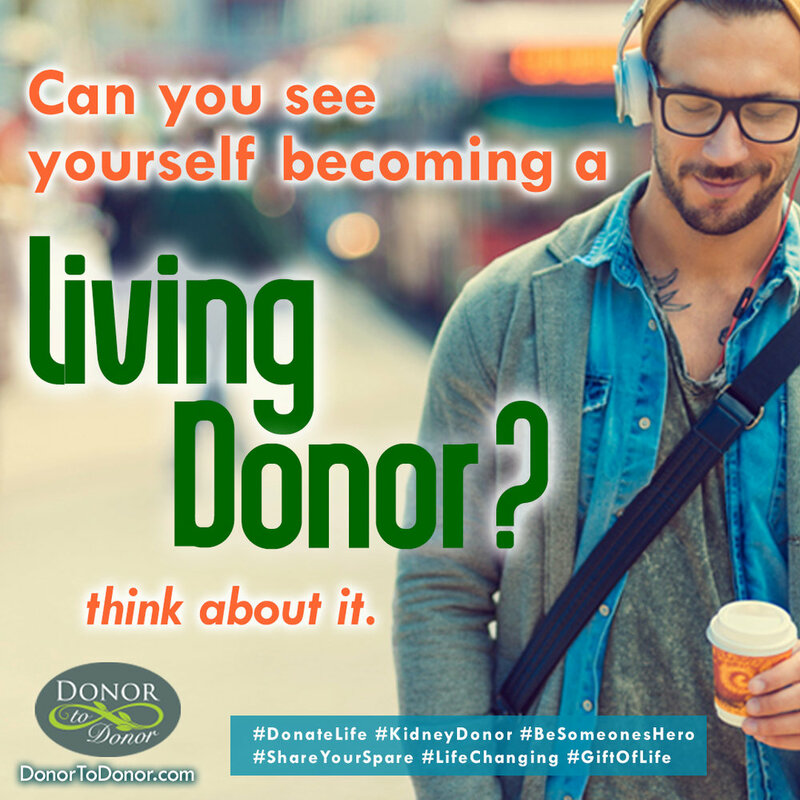 "My interest now is that I want to dispel the notion that you need to be a hero or someone special to donate the kidney. That's simply not the case. It's a simple procedure, and there is very little reason not to do so if you are able." "Chains are a way for one Good Samaritan donor (aka Non Directed Donor) to help many patients get transplanted. Chains are also revolutionizing the paired exchange process by facilitating better donor-recipient matches including some six-antigen matches, which is important because a great match allows the transplanted kidney to last longer. Many Good Samaritan donors choose to start chains because it is a way to help more than one person suffering from kidney failure. One chain typically facilitates anywhere from 2 to 30 transplants," according to the National Kidney Registry. Brooks reached out to New York Presbyterian Hospital in June and went through a series of health testing to determine his suitability as a donor. "At the first meeting you have blood drawn, bring a urine sample from the past 24 hours, and have a psychological evaluation which includes why you want to donate and if you're financially stable enough to take some time off from work," Brooks said. "Then you come back and have a CT Scan with contrast which checks your organs and subsequently you have an ultrasound, EEG, EKG, colonoscopy. One of the benefits of this is that you get thousands of dollars of wellness testing for free." Upon completion of the screening, and with a desirable O-positive blood type, Brooks was told that computer screens would light up across the country. "On September 22 I went in to the hospital, and this was all done laparoscopically," Brooks said. "I went in at 6:30 a.m., was in the operating room at 7:15, the kidney went out the door, by 9:30 a.m., the kidney was at LaGuardia Airport, and by that afternoon, the kidney was in a lady's abdomen in Colorado and she was producing urine." Brooks said there was very little downside to the donation procedure. "There was short-term discomfort. Ten days after the donation I was at my 35th business school reunion," he said. Brooks cited statistics from the National Kidney Foundation which stated that there are currently more than 101,000 people in the United States awaiting kidney transplants, that the median wait time for an individual's kidney transplant is 3.6 years, and that in 2014, 17,105 kidney transplants took place in the U.S. -- 11,570 from deceased donors, and 5,535 from living donors. "There is a tremendous shortage of donors," Brooks said. In Brooks' case, three recipients were taken off the National Kidney Registry waiting list in the chain of transplantation that he began. "My kidney went to Colorado, the donor for the woman in Colorado went to a recipient in Hartford, and another Connecticut man received a kidney," Brooks said. "That third man had donated a kidney to his sister 39 years ago, and as a donor, he went to the top of the list to get a new kidney." He recently received a letter of thanks from his Colorado donee, which read in part:"
You don't know what you have done for me and my family ... I was 37 years old and it was just three weeks after having my second child (when my kidneys failed.) ... I have had to endure the medications, lack of energy, tubes, dialysis 15 hours a week and countless trips to the ER ... all while trying to raise a 7-year-old and a newborn little boy ... If it wasn't for you, I could have waited more than five years ...I hope you know how much you have done for me and giving me my life back." Beyond making the donation, Brooks would like to speak to local organizations about his experience and advocate for kidney donation.